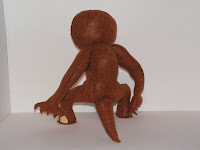 The rancor is made from felt and stands nearly a foot tall at just over 11 inches. He's about 10 inches wide, and though he may look mean and grumbly, he really is sweet and cuddly :) So what am I doing with him? Well I'm auctioning him off for fun and in-game charity in the Star Wars MMORPG that I play, Star Wars Galaxies. I hope he sells well! This weekend I have a few PinkToque shop orders to fill and overall life is really grand! I've not has as much time to craft lately now that I'm working (finally!) full time, but I'll do my best to keep updating and working on projects here and there :) Thanks for looking!